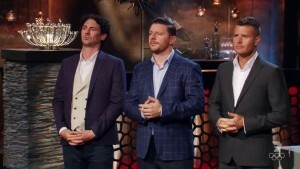 The team challenge tonight on MKR is in Colin Fassnidge’s restaurant. They have 90 minutes to make a restaurant quality dish and the winner will have their dish on the menu. The contestants are divided into two teams. First up, Jason and Eve, Giani and Zana and Anna and Jordan are cooking their mains. Jason and Eve are making liver black pudding. They get off to a good start, but half way they get a bit nervous, cutting the livers thin and pan frying them. They can’t overcook them or it will come out rubbery. Anna and Jordan are making charred octopus is kale juice with a kale salad and creme fraiche. Giani and Zana are mking salt baked trout. They prepare their trout, fill it with lemon and herbs and cover them in salt to go in the oven. Once it is cooked, they take it out of the oven and remove the salt crust. They peel the skin back and it’s cooked perfect. Meanwhile, Anna and Jordan take their octopus out of the pressure cooker, they are concerned they are a little over cook, but proceed to char them in pan, soaked in harissa. Anna and Jordan start making their cream sauce. It’s almost time, the team’s had to start plating up. Jason and Eve are frantic. Jordan isn’t 100% happy with the kale juice and Giani and Zana are happy with their dish. The dishes are going to be judged by the staff at Colin’s restaurant, along with Pete and Manu. Jason and Eve’s dish is first to be tasted. The liver is overcooked, but the black pudding is ok. 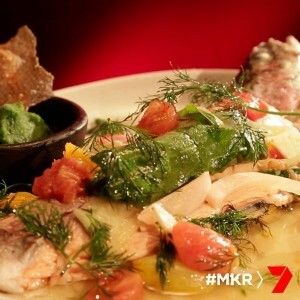 The other chefs think the dish is missing finesse, it’s like they just threw lots of ingredients together on a plate. 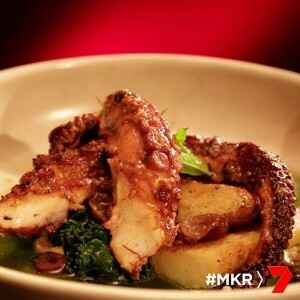 The second dish is Anna and Jordan’s charred octopus. The chefs like it. Pete loves it, the juice adds acidity and freshness to the dish. Colin says there’s nothing he would change on the dish. Manu said the dish could be thicker. Finally it’s Giani and Zana’s salt backed trout. The chefs say that the fish is cooked nicely, Pete says it shows good technique. The dish came with a sorbet on the side, but it didn’t need to be there. The crispy skin from the fish is good. Manu says the fish with the bones is hard to eat. He feels like it could have had the same affect with a filet. Now it’s time for the remaining teams to cook in Colin’s kitchen. Mitch and Laura are making sous vide lamb with crispy brains. Lauren and Carmine are cooking balsamic glazed pork ribs. Tasia and Gracia are cooking pan roasted duck with turnips, apple and miso. Tasia and Gracia make a tester piece of duck and time it in the pan and oven so they know how long to cook the rest of their duck for. Lauren and Carmine finally get their ribs into the pressure cookers. Laura and Mitch are making a rosemary ash to coat their meat in. Lauren is getting worried as one of her pressure cookers has gotten to temperature but one hasn’t and she doesn’t know why. Carmine tells Lauren to calm down and eventually the last pressure cooker comes to temperature. Mitch and Laura have finally prepared their lamb to go in the sous vide machine but they are worried about the time as it will take 20 minutes but they only have 30 minutes remaining. They are really feeling the pressure today. Tasia and Gracia take their duck out of the oven and leave it to rest. Lauren and Carmine open the pressure cookers to check their ribs. There’s 10 minutes remaining and Manu tells the teams to start plating up their dishes. Lauren and Carmine are relieved as their ribs are beautifully cooked. Mitch and Laura’s jus isn’t reducing fast enough. Tasia and Gracia are happy with their dish and start plating. The other teams are putting the finishing touches on. Time’s up. 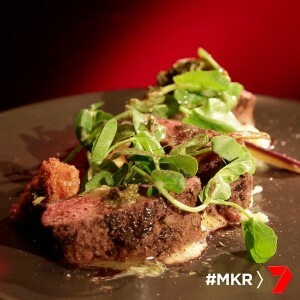 First up for tasting is the sous vide lamb by Mitch and Laura. 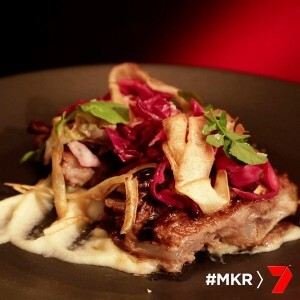 Manu says the lamb is “really, really really well cooked”. The chefs are all happy with the way the dish is cooked. Manu says it could have a little sauce, but it is very well done. Next is the Carmine and Lauren’s glazed pork ribs. Pete says the cabbage is delicious, but Colin says the pickle is the best thing on the plate, The ribs aren’t great, the glaze wasn’t there. They have glazed ribs on the menu and compared to this, there’s is much better. 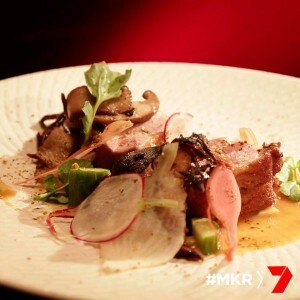 The final dish to be tasted for the night is the pan roasted duck breast by Tasia and Gracia, they chefs love it, and would leave it as it is. Colin says there is a bit too much miso, but his chef disagrees. The winner tonight is Anna and Jordan. 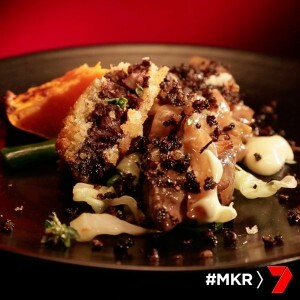 They win their dish on Colin’s menu and an advantage in the next challenge.